In view of this situation, the Union of the People Affected by Texaco-Chevron Operations (UDAPT) in Ecuador - plaintiff in the Lago Agrio case - has denounced the decision of the arbitration panel, accusing it of overriding the rights of the affected communities by imposing the corporation’s right to profits. 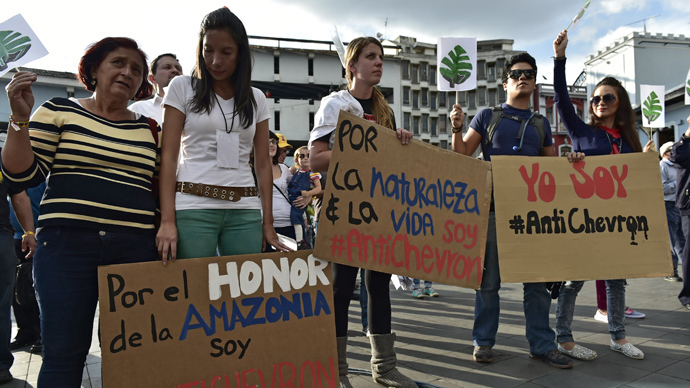 The Union has warned that if the decision of the arbitrators is implemented, this will set a very dangerous precedent for the global fight to protect the environment and defend human rights. The Chevron case in Ecuador, along with other environmental and social crimes involving multinational corporations - from the recent breakdown of the toxic mining waste dams of the Vale and BHP corporations in Brazil, to the repression and criminalization of communities and even the murder of environmental defenders, such as the still unsolved murder case of Berta Cáceres in Honduras -, highlights the need for a legally binding international instrument to put an end to the impunity with which the companies operate, and to offer adequate guarantees to the communities that are resisting and protecting the land. Justino Piaguaje, the president of the Siekopai Original Nation and a spokesperson for the UDAPT, explains that "finding oil was synonymous with wealth. It was thought that all of the country’s financial and social problems were going to get solved - but not so for the native peoples. The problem of pollution started, the rivers got polluted and our land shrank". Chevron filed an appeal, but the ruling was ratified by all the judicial instances in Ecuador - including the National Court of Justice and the Constitutional Court, the highest court in the country. As Pablo Fajardo explains, the Constitutional Court’s ruling of July 2018 recognized that “many rights of indigenous peoples and peasants had been violated by the company", which is something that the UDAPT had been claiming all along – for over 18 years. Thus came to an end one of the most prominent lawsuits in recent decades : one in which an indigenous and peasant organization brought to court and won a lawsuit against one of the largest multinational corporations in the world – the revenue of which in 2018 exceeded 150 billion dollars, almost twice the GDP of Ecuador. According to Pablo Fajardo, Chevron’s defense framework during the litigation involved some 2.000 lawyers from more than 60 legal firms and its defense expenses amounted to 250 million dollars per year. Despite all of this, the UDAPT won. "For reason is in our side", says Fajardo. However, as soon as this great challenge ended, another one began : that of carrying out the courts’ decision. And this has turned out to be a much tougher path to tread because, over the years, Chevron has not only tried to sabotage the legal process against it, but has taken action to shield itself and protect its assets. The UDAPT points out that, throughout the process, Chevron carried out a number of actions to try and sabotage it - from political pressure to threatening international legal proceedings. This “strategy of fear” was adopted in order to isolate Ecuador from its international allies, and was reinforced by an aggressive media campaign to discredit the Ecuadorian courts and the UDAPT defense team. In a global and regional scenario where socio-environmental conflicts are multiplying, not only are multinational corporations - who are now playing the role of the victim - active in generating conflicts, but they are also involved in criminalizing and even eliminating environment activists and defenders of the land - no less than 207 in 2017. Faced with the impossibility of enforcing the ruling in Ecuador, the UDAPT tried unsuccessfully to get other countries where Chevron owns assets that could be seized to ratify it - Argentina, Brazil, Canada and even the United States. But authorities in these countries rejected this possibility arguing, among other things, that the matter involved in fact different companies : "You cannot charge Chevron Argentina or Chevron Brasil with a debt incurred by Chevron Corporation, which is a different company", they said. The company accused Ecuador of "denial of justice". Finally, on August 31, 2018, almost 10 years later, a CPA arbitration panel issued an award in favor of the company ordering Ecuador to annul the decision of the Sucumbíos court and ruling, in addition, that the Ecuadorian State should pay Chevron a compensation amount - still to be determined - for the alleged economic and moral damages that it had caused. However, the problem now is that the 2018 award by the arbitration panel clashes head-on with the decision of the Lago Agrio case in favor of the UDAPT. How can this be ? The key is to be found in some agreements that the company had signed with the Ecuadorian governments between 1995 and 1998 which include a contract freeing the company from obligations, financial or otherwise. Chevron had left the country in 1992. However, it came back in 1995 seeking an agreement that it finally got signed in 1998. According to Adoración Guamán, an expert lawyer for the Campaign to Dismantle Corporate Power - an international coalition grouping more than 200 organizations - the government then and the company signed a "contract for the undertaking of environmental repair work and the freeing of obligations". Adoración Guamán points out that Chevron’s lawsuit kept on mutating as the lawsuit of the people affected in the Lago Agrio case followed its course and progressed. At the beginning, the company argued that the government of Ecuador, by allowing the UDAPT to take legal action, was in breach of the 1998 agreement - thereby incurring in denial of justice. Pablo Fajardo maintains that this is "tremendously arbitrary and illegal" and asks : "What is the point of a country’s law if legal decisions can be suspended by decisions of international authorities in processes which the citizens of this country do not have access to ?" Chevron’s lawsuit in the CPA was questioned from the very beginning by the UDAPT and its allies. In the first place, as Pablo Fajardo points out, because "the Bilateral Treaty of Investment Protection was applied retroactively - something that is illegal and illegitimate". Second, Fajardo notes, "the CPA panel has no competence, no legal capacity to order an independent and sovereign State to annul a final criminal sentence ordered by a court under Ecuador’s legal system". What the CPA panel has done, in fact, is "ordering the Ecuadorian State to violate its own constitution, to break the separation of powers between the executive branch of government and the judiciary, and to get the Executive to interfere in judicial matters in order to have the sentence annulled". Those affected say that the CPA award flagrantly violates their rights, because the 1998 BIT contract binds the government but not the UDAPT. In addition, they argue, the Lago Agrio case is a private trial, in which the government did not intervene - therefore, Fajardo points out, the CPA "is affecting the rights of third parties" in the trial. "It affects and violates the sovereignty of States, which is important as a legal precedent", says Fajardo, and he insists that "if this arbitration award is allowed to go ahead, it could be applied to other States, where national courts of justice will lose the capacity to administer justice before transnational corporations. So, what legal guarantee, if any, do the victims of corporate crimes have ? None whatsoever. Economic power is being imposed and companies are buying impunity", he concludes. This is precisely the aim of the Binding Treaty on Transnational Corporations and Human Rights that is currently being promoted within the framework of the United Nations (UN) by international organizations and the Global Campaign to Dismantle Corporate Power - of which the UDAPT is part.